City of Science returns to Queens! Join the World Science Festival and Con Edison for this larger-than-life, touring event where the wondrous properties of science, technology, engineering, and math collide. Filled with interactive demonstrations, hands-on activities, and enormous exhibitions, this FREE program unleashes everyone’s inner scientist. Jackson Heights People for Public Schools is hosting a forum on school integration on November 29 at the Jewish Center 37-06 77th Street. Visit Mile 13 of the 2018 TCS New York City Marathon, and you're almost halfway to the finish line! Miss Feldman is running the New York City Marathon and is also teaching her students some lessons along the way. Watch Miss Feldman, a science teacher at our school, involve her students in her marathon training. To celebrate its 50th anniversary, Tata Consultancy Services (TCS) created "Empowering Teachers, Inspiring Students," a contest that offered free entry to the 2018 TCS New York City Marathon to 50 deserving teachers. The winners included Andrea Feldman, a science teacher at IS 145 Joseph Pulitzer Magnet School of Innovation and Applied Learning in Queens. 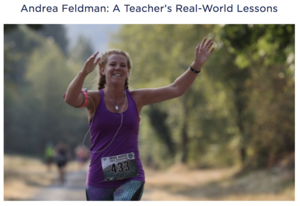 Feldman was thrilled—she gets to run the race of a lifetime and pass along some valuable lessons to her students. Big Apple Award Winner!!! Mr. Ryuma Tanaka!!! Mr. Tanaka works to empower his students while appreciating the experiences that may affect them socially, emotionally and academically. He reinforces to his ELLs students that they are not "English deficit", but are becoming bilingual, and will be twice as valuable in college and job markets once they master English. Please read the attached letter for graduation instructions. . Absolutely no infants and no brothers and sisters under the age of 16 will be admitted. Por favor, lea la carta para instrucciones acerca de la graduación de hoy. No se admitirán bebés ni niños bajo la edad de 16 años. Which High School will your child be attending? Please join us for a workshop to begin the High School Application Process for your child. It is important that you attend this very informative workshop! Looking forward to seeing you on 6/20/18.